Prime minister Tun Dr Mahathir Mohamad held a press conference today to officially announce that the East Coast Rail Link (ECRL) is back on track after a suspension and lengthy negotiations with China. A statement from the PM’s office said that the government chose to go back to the negotiating table as it did not want to pay RM21.78 billion compensation without getting any benefits. The result is a mutually beneficial for both Malaysia and China, and an improved deal for Malaysia compared to the previous agreement. It stressed that early criticism of the ECRL was about the high cost of the deal signed by the BN administration, and not the project per se. The cost is now RM44 billion, which is a reduction of RM21.5 billion or 32.8% from the previous total of RM65.5 billion. The cost per kilometre is now RM68.7 million, compared to the previous RM95.5 million, the government said. With the signing of a supplementary agreement (SA) between Malaysia Rail Link (MRL) and China Communications Construction Company (CCCC), the ECRL will continue. Both companies have agreed to form a 50:50 joint-venture company to manage, operate and maintain the ECRL rail network. “CCCC will provide technical support and share the operational risk after the project’s completion. In addition, Malaysia can also leverage on CCCC’s expertise in operation and maintenance (O&M), hence improving the long-term viability of the project,” Mahathir told the press today, adding that the arrangement would ease the financial burden on Malaysia, which previously had to bear the entire O&M cost. Also, the percentage of local participation in ECRL would also be increased to 40% of the civil works, from the original deal’s 30%, he said. The new ECRL line maintains the standard gauge design, and is 640 km long. The 160 km/h train (80 km/h max for freight) will pass 20 stations from Kota Bharu in Kelantan to Port Klang in Selangor, and the journey will take approximately four hours. The new route passes through five states and Putrajaya, as opposed to the previous four states – the new one being Negeri Sembilan. 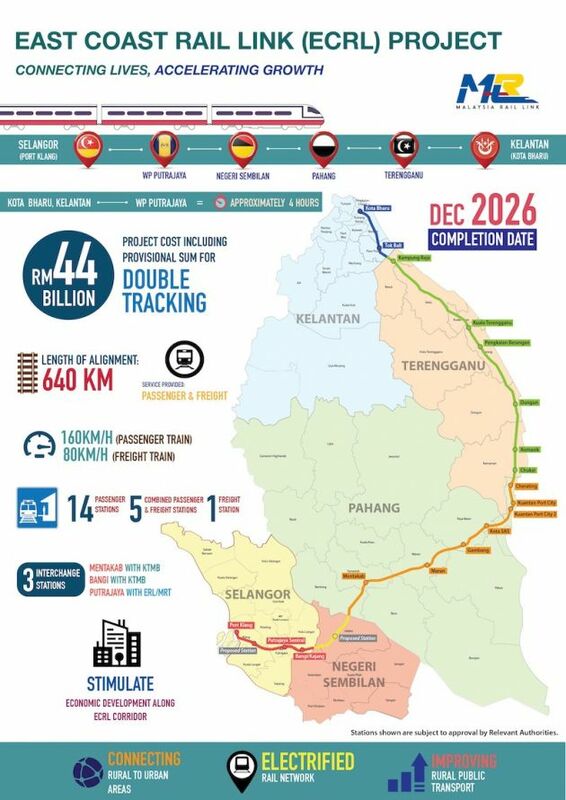 The new route will serve as a land bridge between ports in Klang and Kuantan; and will be connected to the KLIA ERL, MRT Line 2 (SSP Line) and KTM’s Komuter and ETS services. This is described as an improvement over the previous interchange with the LRT at Gombak. The government highlights that the new route does not bore through the Klang Gates Quartz Ridge in Gombak – the longest pure quartz dyke in the world – thus preserving the environment. From Mentakab in Pahang, the new route goes south into N9 before heading to Port Klang via Bangi/Kajang and Putrajaya. The original route was a more direct route through the main range via Bentong and Gombak, after Mentakab. MRL CEO Datuk Seri Darwis Abdul Razak said that work on the ECRL will begin as early as May, subject to the approval from relevant authorities. The estimated date of completion is now at the end of December 2026, compared to the original June 2024 target. Bravo kerajaan mantap & cekap! Kipidap!! Rakyat China money saved. Rakyat Malaysia rugi for giving Megasale discount. Omg RM21.5B saved!! You voted for this right? We voted to save money for China. Why? Who on earth thought it was a bright idea to loop the line down SOUTH then head back up NORTH?! Dummkopf! This is primarily a freight transport line, not a sightseeing train that needs to go thru nearly every state in the Peninsular. It should prioritised the shortest possible distance from KB to Port Klang, and if it needs to tunnel thru mountains then so be it. The Swiss had no qualms in tunneling thru the Jungfau mountain range inspite of their propensity to protect the environment all for the sake of purpose and efficiency. This is just another silly diversion project to N9 by our fantabulous Transport Minister who, to no surprises, was elected in N9. We don’t need a good and beneficial project to be side-tracked (pardon the pun) for someone’s benefits. Be more objective! ermm.. cargo from KB? what cargo? Cargo from Kunming hub China. It’s not further down, just slightly south. Did you see original route? It’s further north! Instead of north with tunnel, just take a bit south with no tunnel. Your “further down” goes into another state unnecessarily. How does this make any economic sense? And your “further north” is moot because the line is traveling from the NORTH! From Mentakab to Port Klang, the original route envisioned is the most direct path. If you see original route, from Gombak it will take further north to Rawang & Serendah then downwards again to Port Klang. From Gombak, it’s like semi circle route to Port Klang. I bet it’s not even 50km (maybe almost the same, I’m not calculate it yet) more from Mentakab to Port Klang using new route than original route. Our previous government suka suka sign any project deal that can hancurkan our country. One of the compelling reasons for ECRL is for people can live outside KL and yet come to work everyday into KL. Imagine Bentong and Mentakab becoming satellite towns. This is the case with ETS and KTM Commuter. That is to spur community development outside KL with lower cost of living becomes the main draw. Now that the new route bypasses KL, I wonder is it neccessary at all to have ECRL. Sometimes politicians’ ego is more important than common sense. Mentakab is still in the route. Previously connection only in Gombak. Now you can connect to KL from Putrajaya. 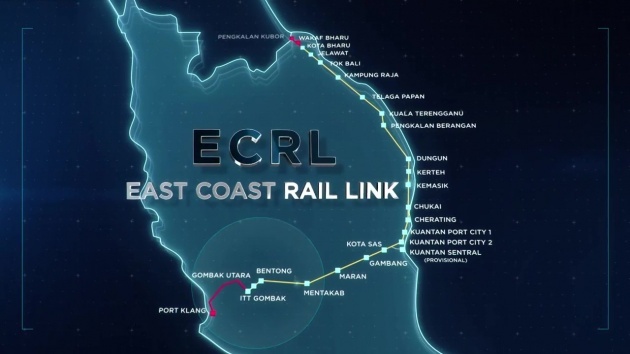 ECRL is not just to connect neighbours to KL, it’s for intercity with east coast, hence the name. Govt keep saying they ‘cost saved’ it… it is not a cost saving effort… it costs less because of change in job scope and specs. BN Govt had planned a tunnel to bore through ‘Klang gate Quartz Ridge’. In not doing a tunnel they say they are preserving the environment. That’s debatable… boring a tunnel has little impact on the overall environment. This tunnel itself would cost RM10bil. Thus not doing the tunnel means not spending that RM10bil. BN Govt quoted ECRL development would cost RM55bil. PH Govt quoted the project would cost RM66bil.. RM88bil.. RM100bil.. depending which media and when. BN’s RM55bil – RM10bil = RM45bil. Same difference. At a ‘saving’ of RM10bil… the full trip would no longer be covered in 4 hours… now it will take a full 5 hours..! BN Govt would had kept the operating concession local by M’sian company. DAIM now signed an amended agreement that will see 50% of operating concession owned by China company…!! Its like the toll consession issue back all over again..!! Penny wise pound foolish, I’d say. I do agree with the 50:50 concession. its hard to be profitable for an train company. Its makes more economic sense to share the risk for uncertain business condition – these ECRL will make operating losses for decades – without any other revenue line. It will push the Chinese to oblige & fulfill their commitment of TEUS numbers from KTN to PKG. RM55b is not true, just like LRT3 cost. If you care about the number, just do a bit research then you know why. This project is not profitable directly, much like MRT & LRT. The operator will not get any profit like MRT. By doing 50:50, it’s a risk sharing. It’s an infrastructure project after all. Not profitable directly…? Of coz not. That is why its called ‘PUBLIC TRANSPORTATION’… and not an ‘All frillls travel service’. This is not meant to be a money making scheme… but a sustainable public oriented project. It is menat to move people and boost connectivity. Its the same as the ETS along Padang Besar to Seremban, continuing from Gemas to Johor Bahru soon. Yet KTB are starting to make profit a few years back. 4 million passengers have used the Northern Padang Besar to Ipoh to KL ETS line. Most nations cover the cost of these infrastructure anyway. With ECRL there will be income generated from other means… such as rental, advertising and misc fees. Kerajaan PH terbaekk! Mantap gitu!! ECRL jimat RM21.5B + RM16.5B jimat LRT3 ! So in essense, the cost reduction is due to cutting cost measures such as lesser stations, reroute, etc. Not like the PH accusation that the previous govt stole the money? It’s there any reduction in planned stations? Even the big 4C’s China company can get back to negotiation table and sign a new supplementary agreement, imagine what can the G do with toll concessionaires. Wait for cheaper toll rate to come. T begged 4C to take palm oil. In return he is giving more than what the 4C previously demanded. ECRL we want to renego coz we want more benefits. Highway we won’t renego coz we already got benefits. govt already announce cheaper toll rates right? If i drive from Gombak to Bentong and use the highway, I probably have to pay RM 10.00 one way for toll. If I use the old highway to Bentong via Gombak old road, I save RM 10.00. This is not cost saving, but cost avoidance. If you buy a 12 inch Subway, it is RM 14.50. If you buy 6 inch Subway instead, it is RM 8.50. This is not cost saving but cost avoidance. If you build a railway track or a highway and reduce the distance from 150km to 100km and change or reduce the specifications, it is not cost saving, but cost avoidance. And how much more are we incurring for the realignment? should let tony pua do the nego.. he said before the cost around rm30b… daily light robbery!!! pay for merc, got an axia!!! don’t bash me! google if you don’t believe what i said about tony..
Agreement was signed, work has started. Renegotiation is always harder. You may get that amount if you call new tender. The fact that such HUGE contract awarded with direct nego without tender is something you should think! So why is this now direct awarded to Vincent Tan affiliated company? Something you should think too right?